BEND, OR -- A northeast Bend chicken coop was destroyed in a fire blamed on a heating lamp, Tuesday afternoon. 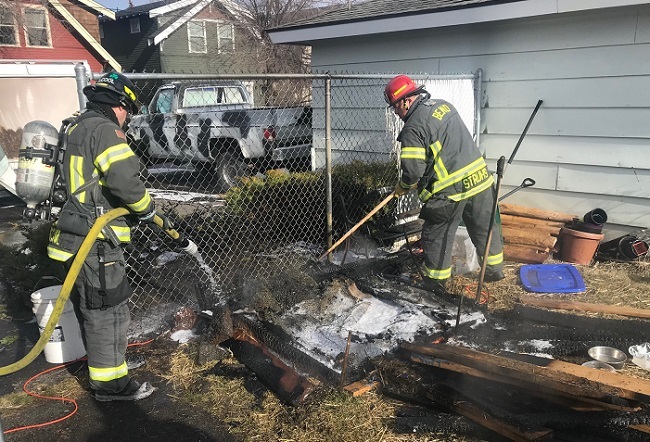 Firefighters responded to the home near Fourth and Hawthorne, across from Hawthorne Station, just before 12:30 p.m. and found the coop fully engulfed, with flames spreading to brush. They were able to stop the blaze before it reached a nearby detached garage. Fire investigators say a heat lamp secured by a clamp inside the coop fell into bedding, igniting the fire. Officials suggest heat lamps used for animals be secured to their supports by more than a clamp, which loses strength as it warms.